The H-8 Big Bale Horse Hay Feeder was designed specifically for horses, but work well for a variety of other animals including horned cattle, donkey’s, llamas, alpacas, and more! Think about it, most horse hay feeders were originally cattle feeders that have been modified to make them “sort of work” for horses. Years have gone into the research and development of these hay feeders that have been built from the ground up with only horses in mind. Our recent discovery shows this design also works well with similar sized animals. Whether you’re using small squares, large squares or big round bales, we have the model that will fit your needs. These feeders were designed with maximum hay savings and your animals safety in mind. Video of the H-8 Hay Saver Feeder above. You’ll see how the H-8 Hay Saver Horse Feeder works. Safe, durable and cost effective. Fits big round bales or big square bales. 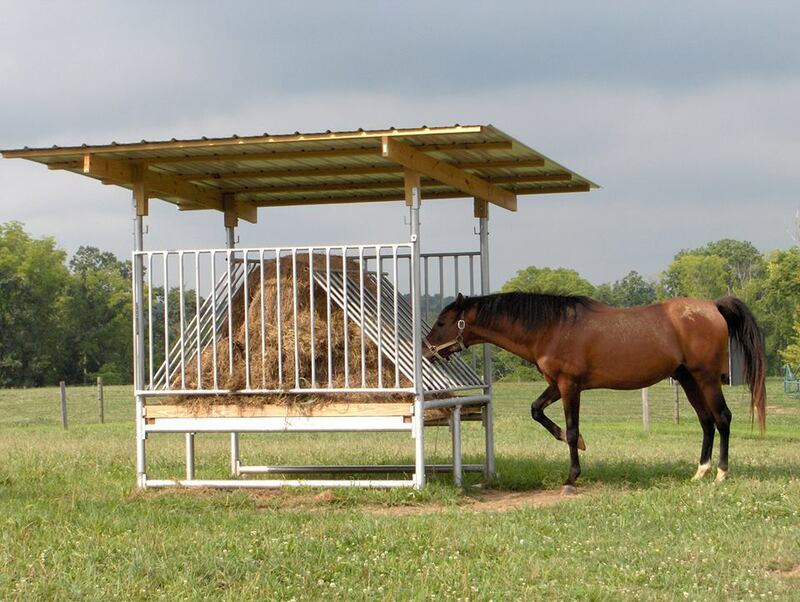 The patented fold down grills of this horse hay feeder are designed to make it impossible for your horse and animals to bury his head into the bale, thus eliminating breathing problems from inhaling hay dust. This feature also helps reduce eye irritation from being poked by hay stems. The grill can be locked into the upright position to make it safe for the horse and animals when you are loading a new hay bale. This feature also allows you to discontinue feeding at any time and it makes this hay feeder a breeze to clean out. Has brackets to attach a roof which will help keep your bale dry. This is also a great way to make a shelter or shade for your animals. This feeder also has a floor in it, which keeps your bale off of the ground and fresh. This horse hay feeder is practically waste free. It’s amazing how much hay this feeder really saves! Some assembly may be required and the floor lumber is included. The 7′ horse hay feeder model can be used with a large round bale or several small square bales. The 10′ model can be used for a large square, 2 smaller round bales, or several small squares. The 12′ model can hold 2 large round bales, 1 big square bale, or several small square bales.